Looking at all the pending blog posts that I have on my draft folder, I just realised that I haven’t worked on the writing since long time. I have so much to catch up! I will try my best today, and finish as many as I can. Usually I cook every Sunday, but this one that I did was on Wednesday. Instead of cooking beef brisket in Chinese style with turnip, let’s try to do the beef brisket in Western style, of course one important ingredient is red wine. My husband always prefer lean meat, he doesn’t like to see the fat in-between the beef brisket, which Chinese always love to have a bit of fat in-between. So, I got a big piece of beef brisket with less fat for this dish, and chop it into big cubes. Heat up the Dutch oven with some butter and a touch of olive oil, put some minced garlic and diced onion, brown them a bit and then put chopped carrot into it, cook them for a minute or two. Then put the beef brisket in, brown them until all surfaces are cooked. Now, pour in some red wine, and let it simmer for few minutes. Then, put some tomato puree, dry oregano and bay leaves, and fill up the pot with beef stock. Cover the lid, and let it simmer for 1.5 to 2 hours. You can also cook it inside the oven with 200C for an hour or 1.5 hours. This dish always taste better overnight, you can cook a big pot and save it for the next two days. It goes well with bread, potatoes or even rice. I have this recipe with me for few years already, I kind of figure it out my own way by imagining how this should be. Of course, after learning some Thai recipes, I’ve adjusted it a little bit, but more or less it stays the same. The good thing about curry is you can have it with different kind of meat, seafood or even vegetable. Tonight I am doing this with beef, but as I said, you can do it with many other ingredients. Of course the key ingredients are kaffir lime leaves, shallots, lemongrass, galangal, and red chilli pepper, you can get this as a tom yam pack in some super markets. Heat up the pan with some oil, then fry these ingredients with a medium heat, add cabbage, mini corns, mushrooms, Thai eggplant and okra in the pan and stir fry them. You have to look into the kind of vegetable you have and the combination with the meat, calculate the cooking time of each of them, and try to put them in the pan by sequence of the cooking time needed. I really don’t want to over cook the beef, of course depends on the cut of the beef, try to watch out the time and keep that in control. Put Thai green curry paste into the pan, then add coconut milk. Stir them well and let it simmer for around 10 minutes or until it’s done. Taste and season with salt as you like. You can serve the curry with rice or bread, garnish them with some fresh coriander and squeeze of fresh lime juice. I am always concern about the environment, and lately I am looking into zero-waste cooking. Actually you just need to be creative and always have that idea in your mind, try to really think again before throwing anything away. You might surprise yourself how much you can make use of from the food waste that you created. Today, I am making some snack bars from the leftover pulp that I’ve got from juicing with tomato, carrot, red bell pepper, celery and some ginger. It’s always a shame to throw away the pulp, there are a lot of ideas for leftover pulp, but today I am sharing this idea of making snack bars with you. We already kind of give up the idea of having chips and other junk food at home, we rather have healthy snack, such as fruit, cherry tomatoes, celery, cucumber and carrot. This one could be one of the healthy snack on our list when we are hungry in the middle of the day or in the middle of the night. So, I am using around a cup of leftover pulp, mix with half cup of pumpkin seeds, and half cup of mixed nuts. You can also add some raisins, but I don’t really like raisins so I don’t add them. Then, we add one tablespoon of olive oil or coconut oil, and three tablespoons of honey or syrup. I preheated the oven to 200 degree Celsius, and we just have to mix all the ingredients and press the mixture into a baking tray. A little tip is to use the back of a spoon to help and flatten the snack bar mixture to around 1cm thick. Then you can add sesame seeds on top as a final touch. Bake the snack bars for around 20 minutes, let it cool down after baking, and then cut them into small pieces. You can store them into vacuum jar or even freeze them. It’s such a great idea, to make use of food waste and stay with healthy diet. You can also give this to your dogs if all the ingredients are dog safe, you just need to check it out and make sure they are good to eat them. I’ve cooked this shrimp dish the other night when my friends were over for home party. I am thinking to redo this dish with salad and quinoa, so I recreated it for a weekday dinner. First of all, get some fresh prawns at the wet market, if you are not ready to cook them right away, you can just keep them in the fridge until you are ready to cook. Before cooking the prawns, which is going to take only 10 minutes, you better start with cooking the quinoa. I would like to use some chicken broth this time instead of water, to cook the quinoa with the rice cooker which make everything so much easier. If you don’t have rice cooker, you can just use a sauce pan. Put 1 portion of quinoa and 2 portions of chicken broth in the rice cooker, then cook until it’s done. You better let them cool down before serving, so by the time you get the prawns done, the quinoa should be already cool down. Get the prawns out from the fridge, clean them and cut the antenna, and maybe also trim the pieopods (legs) a bit. Heat up the sauce pan with some butter and a touch of olive oil, add minced garlic, some red chili pepper if you like spicy. Then, add the prawns and some lemon slices , fry them until they turn pink, finally add finely chopped parsley and season with salt. Serve the prawns on top of first layer of spinach salad with second layer of quinoa. You can also serve the prawns without shells, as that will be a bit more easier to eat. Use the remaining oil from the prawns as salad dressing. Let’s do green Sunday again!!!! It’s really refreshing and it’s a good idea to keep doing vegetarian dishes on Sunday, just to clean up the system. So tonight I am thinking to do a vegetarian pasta, I tried to search for ideas online, and I found this caprese salad with pasta. Yes! Why not? I love caprese salad, so why not trying make the pasta version out of it?! This dish is basically very simple, as simple as the caprese salad, cherry tomatoes, mozzarella and basil. You just have to choose the kind of pasta that you like to go with the salad, I suggested to go with something short, like what I did with fussili or even penne. Try not to use something long, like spaghetti or linguine. If you like, you can also use broken spaghetti, but short pasta for sure make more sense for this dish. First of all, get the fussili pasta ready by boiling them in a pot of hot water, by adding some salt in the water as well. On the other hand, get some olive oil in a hot pan, add some minced garlic, then simply fry the halved cherry tomatoes, and hand shredded mozzarella for about 30 seconds to a minute, season them with a pinch of salt. Basically, you can just eat them raw, so no need to cook them for too long. Add the basil at last, then put all the fussili into the sauce, and mix them well. You can decided to serve it hot right after you cook, or you can have them as salad by chilling them in the fridge. I like to eat it hot right after cooking, season them with some black pepper and garnish with a touch of fresh basil on top. Wala……. so simple and so quick! Again! One week past and I did not get my last Sunday recipe written and posted, so bad! Was too busy last week, now business networking going on and running around with different events. So, when I have a new post this week, of course I remembered that I better get the one from last week done. So, here I go! The one from last week was a National dish from Denmark, it is a pork belly dish and usually they serve this with boiled potatoes, I would like to go for mashed potatoes instead. So, the first thing you should do is to get the potatoes steamed in a pot of hot water. On the other hand, you can get the pork belly ready. I would say, by the time that your steamed potatoes are half-way through, you can start to work on the pork belly. Preheat the oven under 180C, season the pork belly with some salt and pepper, then coat a nice layer of olive oil or melted butter on the pork belly. Then place them nicely in the oven and grill them for 20 to 25 minutes, flip it over in the middle, and make sure they are all browned and nicely grilled. 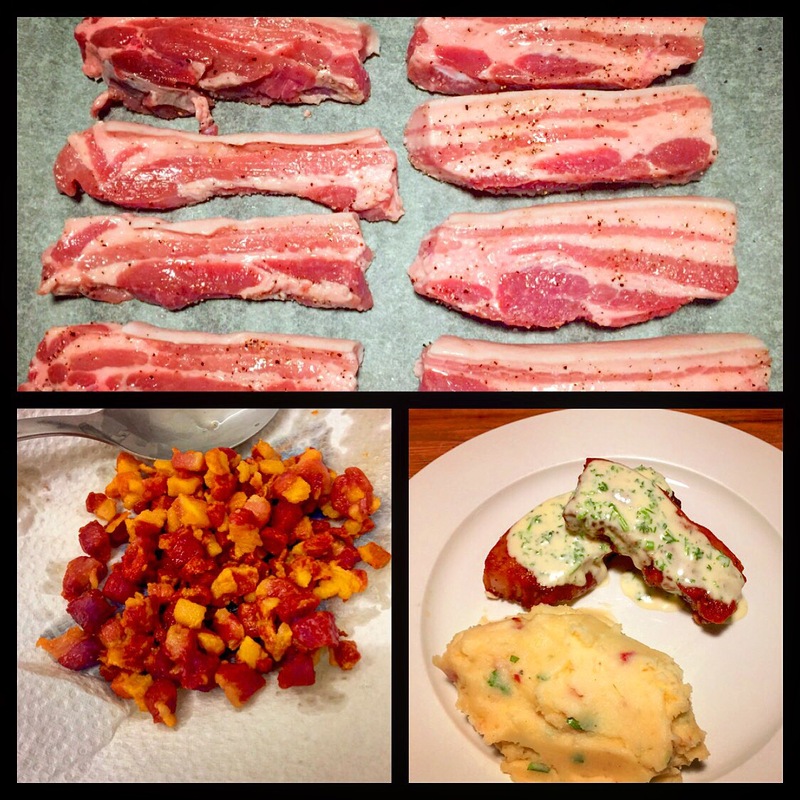 We are using some bacon or pancetta to create more texture for the mashed potatoes. Fry the bacon or pancetta in a hot pan until they turn crispy, chop them in small dices. Set the bacon aside for later used. For the mashed potaoes, use the masher to make mashed potatoes, let them sit in a large bowl. Now boil the cream in a pot, on the other hand, we pour in the oil from the bacon into the mashed potatoes, mix them well together. When the cream is done, pour them slowly into the mashed potatoes, mix them well together, add some grated cheese if you are a cheese lover. Then add in diced bacons, spring onion, and taste to add salt and pepper. Leave them in a bowl with cling film under the heat of some hot water. Keep it nice and warm until you are ready to serve with the pork belly. Now, we have to get the creamy sauce ready. Melt some butter in the hot pan, then stir in some plain flour, keep stirring and let it cook a bit. Then, pour in heavy cream, and let them zimmer until it turns thick. Add in a lot of chopped parsley for the flavour. When the pork bellies are ready, get them out from the oven and serve them with some creamy sauce on top, and the mashed potatoes aside. The best is to finish all pork belly in one go, they don’t taste good overnight, so try not to leave any leftover. I have this outstanding dish from last Sunday that I better get the writing done, as I’ve already got the new Sunday dinner dish that I need to write soon! 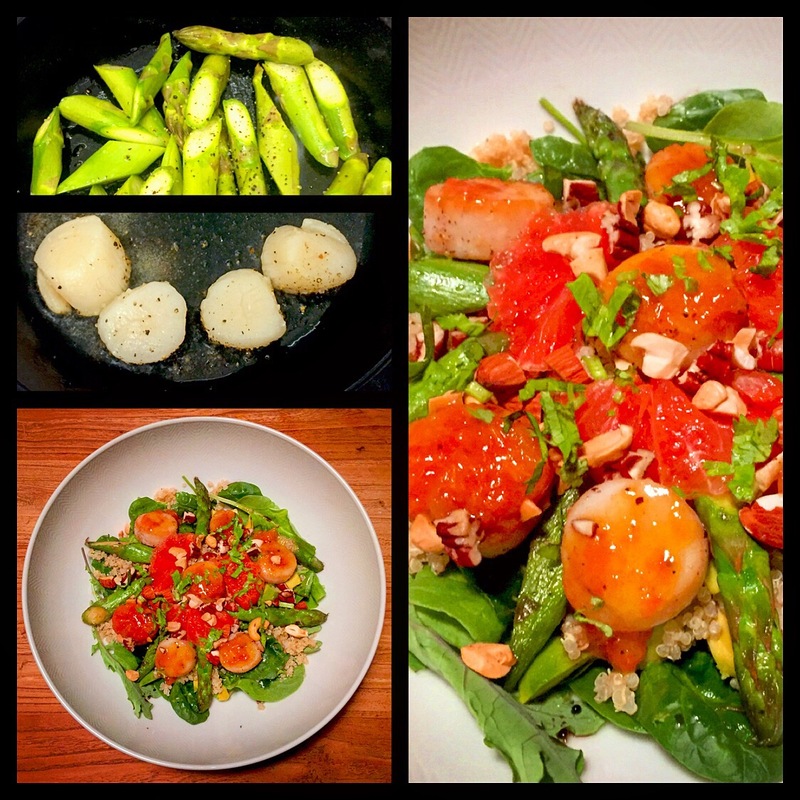 Last Sunday, I cooked this healthy dish with salad and quinoa based with a touch of scallop as high light. I went out for dinner on Friday with two friends that are both health conscious, we did talk about healthy diet during dinner, so I was thinking to have something healthy for Sunday dinner. Was thinking to cook something vegetarian or even vegan, but ended up with a seafood dish. You might not be able to see, but actually I’ve added other greens into the dish. Besides the green salad, I put asparagus and avocado as well. To start with, I put the quinoa in the rice cooker, and let it do its work, so that I can work on other things. Before cooking the scallops, I would like to get the asparagus ready first. Cut the asparagus into thick slices, pan fry them with butter and season them with salt and pepper when they are done. Let’s get the dressing ready before cooking the scallop. Heat up the pan and place some butter in, let it melt and cook a bit, then add in plain flour and keep stirring, then add in some freshly sqeezed grapefruit juice and cook until it’s thicken up, then season with salt and pepper to taste. For the scallop, season them with some salt and pepper, then fry them with a hot pan in butter. Watch out the time as you do not want to overcook them. Get the plate ready with green salad, asparagus and avocado as a base, then season them with some olive oil, balsamic vinegar, salt and pepper. Then add in some quinoa and place the scallops on top, final touch with the butter grapefruit dressing. It’s so refreshing and light!